Namco Bandai released a new trailer for Ni no Kuni II: Revenant Kingdom just ahead of next week's Gamescom expo. Showcasing battle footage mixed with story elements, next January is going to be very special with this game's release! Have you ever been on the unpopular side of the equation? Sure, you have. We're all gamers, right? Cheap joke aside, I'm actually referring about having an opinion towards a game that is more positive of an outlook than most. That's where the start of SuperPhillip Central's Unpopular Opinion series of articles took root, setting the stage to allow me to talk about games that I liked that either are extremely polarizing or just considered poor games overall in general. Do you have your own games that you're on the minority in opinion of? Ever since Paper Mario: Sticker Star on the Nintendo 3DS, the Paper Mario series has strayed from its partner-centric turn-based battles, heavy story focus, and traditional RPG design. Sticker Star was no doubt the change of the Paper Mario series that strayed the most from the winning formula. While Sticker Star was still enjoyable for me, I find the Wii U's Paper Mario: Color Splash to be a stellar entry in the series. While original characters weren't represented--instead it was a myriad of Toads of various outfit colors as typical Super Mario Bros. series characters--there was a larger focus on story and absolutely hilarious dialogue and story segments. Sure, the card battle system still centered around using the right item card or Thing card at the correct time against bosses, and most battles were merely a means to get through the game to the next humorous part of the game, the puzzles involved, the exploration featured, and the memorable world, setting, and characters made Paper Mario: Color Splash a colorful delight to SuperPhillip Central. There wasn't too much to choose from retail-wise when it came to the Nintendo Switch launch back in early March. Sure, you had the immense blockbuster of The Legend of Zelda: Breath of the Wild, but if you wanted a multiplayer release, you didn't have much in the way of options at the time--at least on store shelves. 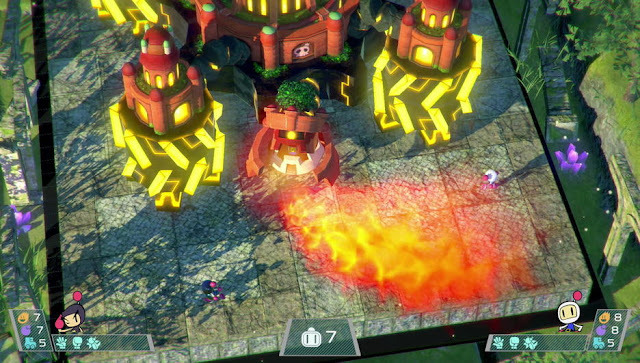 Super Bomberman R from Konami not only filled that niche well and saw the return of Bomberman to gaming, but it managed to sell quite well. Critically, the game was filled with issues, such as weird camera angles, limited multiplayer options, hard AI, and the like, but SuperPhillip Central enjoyed the game regardless. Fortunately, most of the issues I found with Super Bomberman R have been fixed via patch. The ability to move the camera away from being diagonal with the action, more multiplayer choices, AI that you can set on multiple difficulties that don't read your controller inputs, and new, free DLC in special maps and characters were all included. 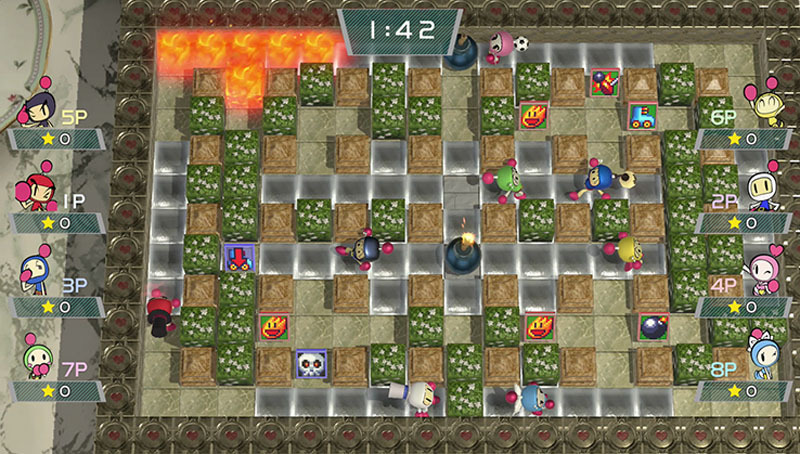 Now's the time to return to Bomberman's own return to gaming! While it's true that on SuperPhillip Central's Top Five Yoshi Platformers list the Nintendo 64's Yoshi's Story is only ranked higher than the critical and commercial flop, Yoshi's Topsy Turvy on the Game Boy Advance, Yoshi's N64 expedition is an actually good game all the same. 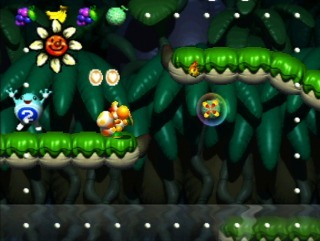 No doubt a lot of the criticism around Story's initial release was that it was coming directly off of the entry beloved by fans, Yoshi's Island, but removing that comparison out of the equation, Yoshi's Story presents charming visuals, the ability to choose the game's difficulty by either finding and eating all 20 melons per stage or just consuming all fruit you find, multiple play-throughs as you can only choose one of four stages in each world each time you play, and other enjoyable aspects. Of course, the things that distract from fully loving the game include opportunities to miss melons in levels (resulting in no possibility to complete that level perfectly), a rather low difficulty challenge-wise--especially with bosses, and a huge step down in musical variety from Yoshi's Island (sorry, had to bring Yoshi's Island back into the equation again somewhere here!). Otherwise, Yoshi's Story may not have been the sequel gamers and critics wanted out of Nintendo after Yoshi's starring role on the Super Nintendo, but it was an appealing game all the same. 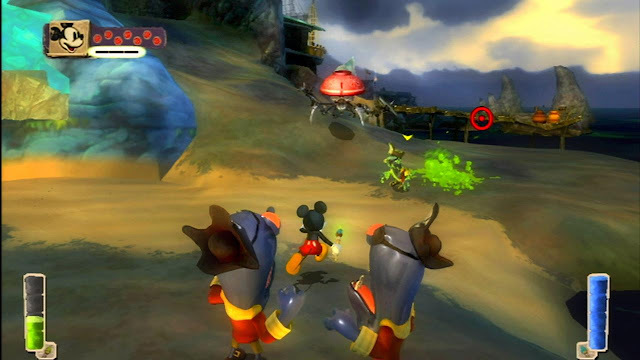 Disney Epic Mickey had a lot going for it at first: a project from the mind of Warren Spector, one of the forces behind Deus Ex; a dark, steampunk art direction as seen in the concept art; and for diehard Disney lovers, the return of Oswald the Rabbit. Then, sadly, reality stepped in to crush many gamer hearts. For one, the game was releasing on the less powerful Wii, a system that could only hope to bring 1/8th of the awesome concept art to life in game form; and two: it just wasn't a polished game. So, I know what you're thinking, "Phil! 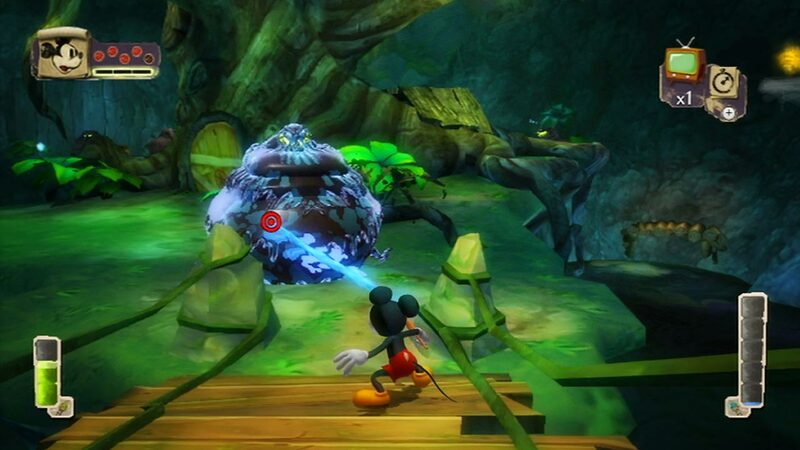 What could you honestly like about Disney Epic Mickey after all this soul-crushing disappointment?" My answer would be that Epic Mickey had plenty of good ideas, and it's just that they weren't executed to their fullest potential. I'm referring to things like the paint and thinner mechanic, the choices in the game at certain parts of the story that overall didn't really do anything, and the quests, which were oftentimes locked off as you progressed through the game. Also, the platforming in general was tight, the worlds that are fun to explore, and the personality put into the game. No, Disney Epic Mickey has more than its share of compromising problems, but the positives outweighed the negatives in this particular case. Crash Bandicoot is in the minds of both mainstream and veteran gamers thanks to the excellent remasterings of Crash Bandicoot 1-3 on the PlayStation 4, attesting to the fact that Crash still has it in terms of nostalgia, popularity, and hype, evidenced by its sales figures. It's important to note that even though Crash 1-3 and, of course the marvelous Crash Team Racing, are tremendous games, later ones that didn't involve Sony or Naughty Dog weren't all awful. For example, how about Crash Nitro Kart--a game that definitely had influence from Crash Team Racing, including the formula, the structure of the story mode, the modes, and similar kart handling! Crash Nitro Kart had excellently designed levels with creative opportunities to take daring shortcuts, pass by opponents, and make any racer regret getting on the same racetrack as you! 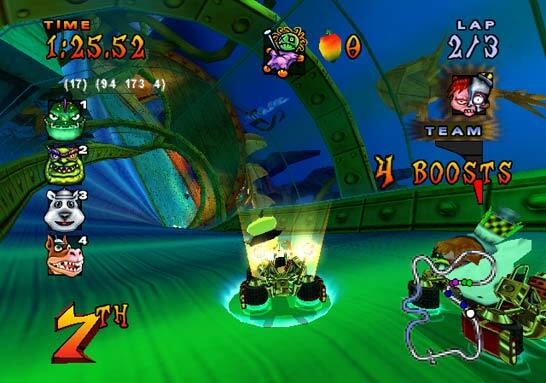 Though not featuring as many courses as CTR, Crash Nitro Kart did have some new tricks up its collective sleeve. 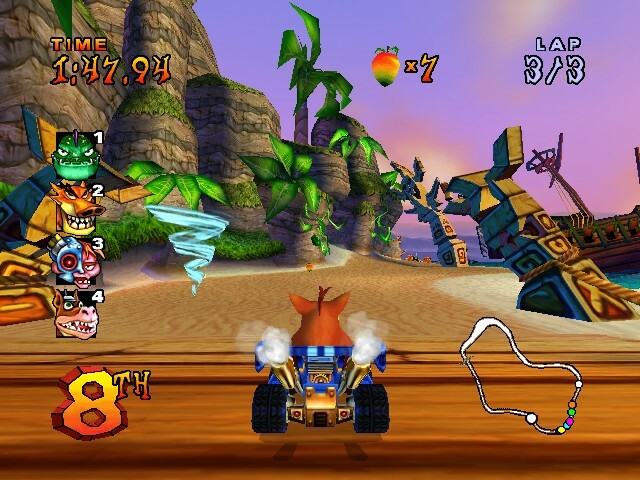 Perhaps the game was unfairly compared to Crash Team Racing, which to be fair is only one of the best mascot racing games of all time, but don't sleep on the opportunity to give Crash Nitro Kart a chance. 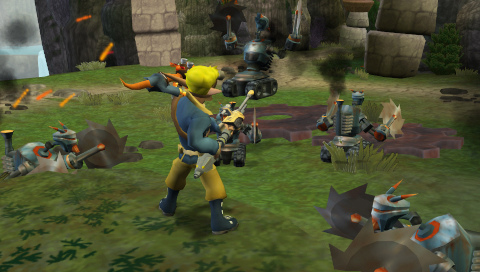 After a small absence, Jak and Daxter returned, but this time to the small screen. Well, the small screen in the sense that it first released on the PlayStation Portable before shortly after getting ported to the PlayStation 2 where players hopefully had a bigger TV than their PSPs. Regardless, original developer for the series, Naughty Dog, had since moved far away from Jak, Daxter, and the world they created (and also the edgy crap from Jak II and on that they felt was needed). Thus, a different developer took the role of creating the fourth chapter in the series, The Lost Frontier. Many find this a lesser entry in the Jak and Daxter franchise for various reasons. Some thought it didn't have the same stakes as the original games, some didn't like the lower budget compared to the PS2 trilogy, while others were stupid in thinking that if Naughty Dog didn't grace the game with their amazing, ungodly talent (don't get me wrong--they make great games, but they are far from perfect), then it wasn't a good game. On the other hand, I enjoyed this bite-sized outing with Jak and his wisecracking ottsel companion, running and gunning, blasting away at baddies, and even flight mission segments that were fantastic and broke up the action. 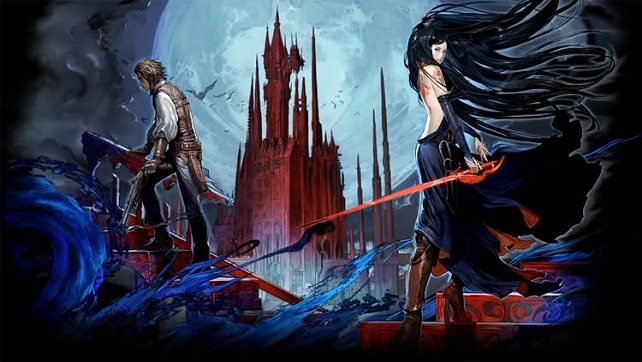 With the recent release of its own limited Netflix series, Castlevania is once again on the minds of many, after being in MIA status for several years. There is no better time to talk about one of the more frowned upon Castlevania games in the series than now! Let's get all of the stuff from Castlevania Judgment that I agree was bad out of the way first: the character redesigns were oftentimes laughable, the implementation of motion controls was terrible (though one could use the Classic Controller for much better precision), and the camera could certainly be more of an enemy than the character you were fighting. 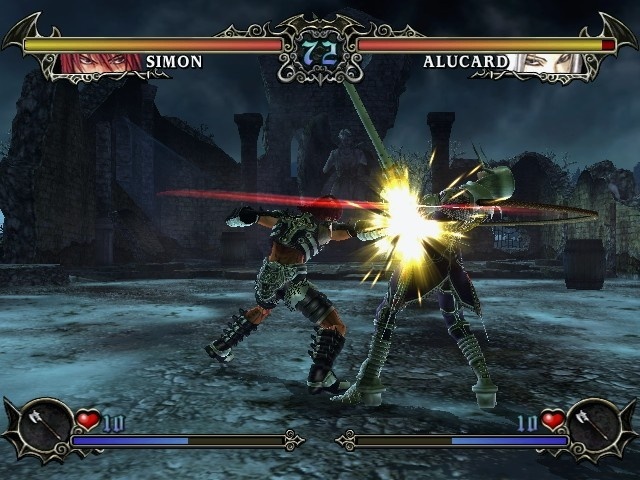 However, there were still aspects about Castlevania Judgment that I really enjoyed, such as the character roster and variety, the story mode, the visual for the time (and for the Wii, of course), the rockin' remixes of past Castlevania themes included in the game, the fighting in general (albeit basic), and smaller things that added up to a 3D arena fighter than I overall liked--liked, not loved. Do you remember the Capcom Five? 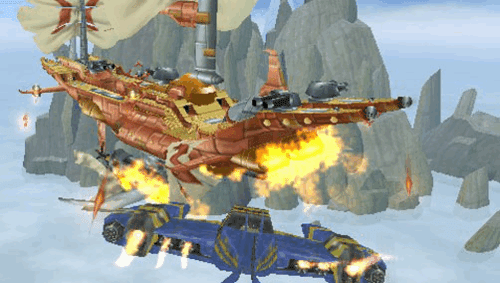 It was initially a group of five exclusives from Capcom set to release solely on the Nintendo GameCube. Whether a failure of communication or poor planning, only one of these titles actually became exclusive to the GameCube and it was a commercial and critical bomb (P.N. 03), one was cancelled outright (Dead Phoenix) and the others were either given late ports with added content (Resident Evil 4 and Viewtiful Joe), or released at the same time as is the case with Killer7. Killer7 was a psychological thriller with quite polarizing opinions about it. 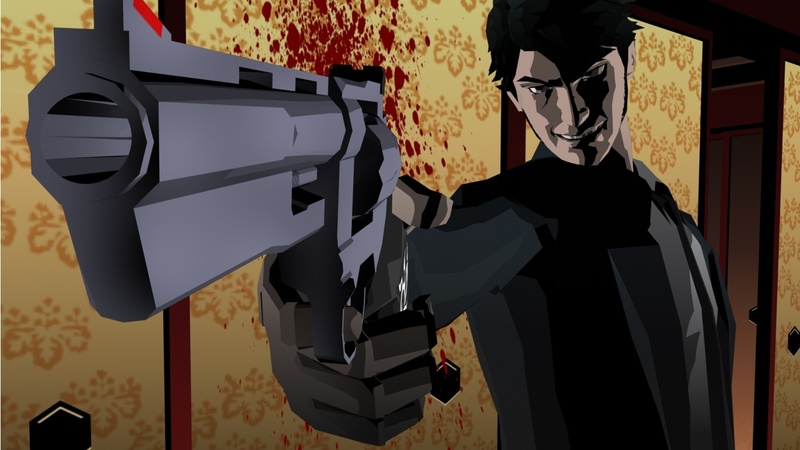 A blend of first-person aiming and shooting with third-person exploration, Killer7's uniqueness laid in its insane story and limited movement capabilities. Instead of being able to roam around, players were forced to move along predetermined paths through levels. 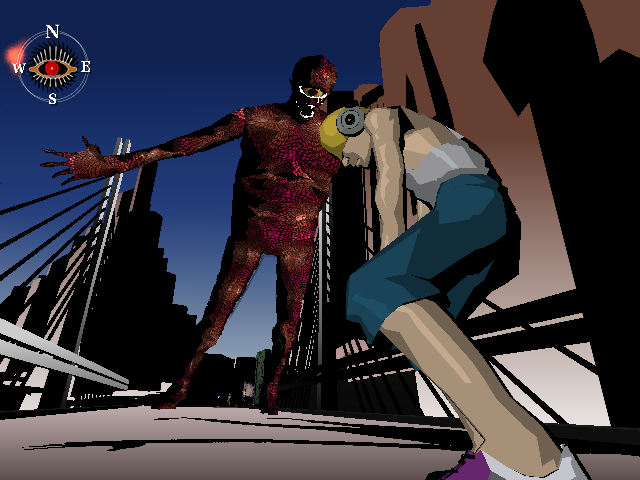 Regardless of criticisms to the game, Killer7 has since received a bit of a cult following, as well as it bringing director Suda 51 to a grander audience with clout than ever before in his career. In time for next week's Gamescom is a brand-new story trailer for Marvel vs. Capcom: Infinite, an all-star fighter releasing next month on PlayStation 4, Xbox One, and PC. Including in this trailer is the roster additions of Marvel's Ghost Rider and Darkstalkers' villain, Jedah. According to Capcom's YouTube account, the base roster will be at 30 characters with more on the way with DLC. The reviews on SuperPhillip Central for August continue with Fabraz's Slime-san, now available for the Nintendo Switch. Check out my detailed thoughts on the game with my review! Goo-ed to the last drop. Poor slime. Just casually strolling about, doing his own thing, and not causing trouble for anyone when all of a sudden a gigantic worm consumes him from behind, completely whole. 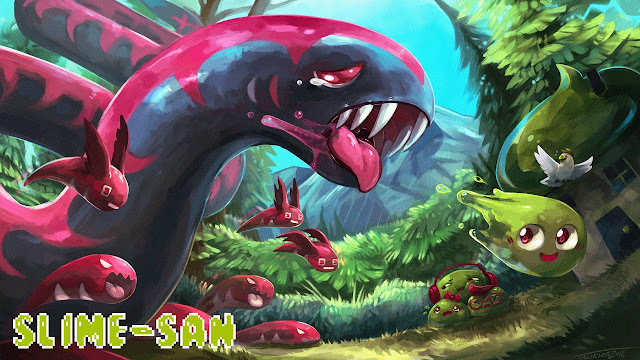 Now, our slime-tacular friend is in need of finding his way out of the worm's massive insides by running, jumping, and sliding through 100 levels of twitch-based platforming in Slime-san. 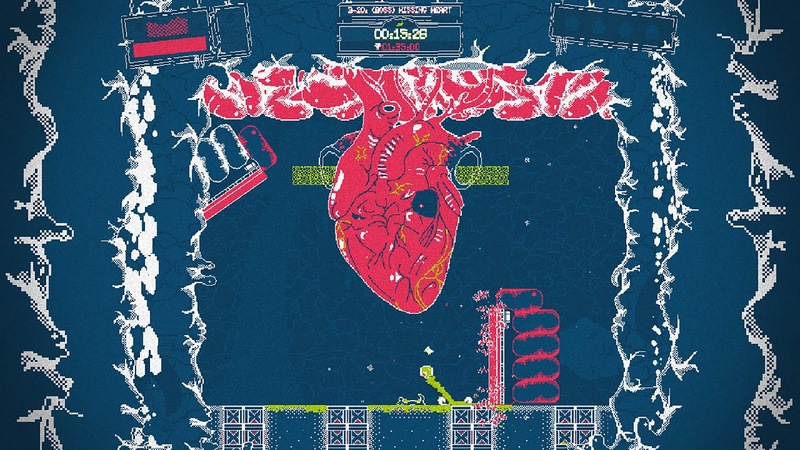 Released on Steam and recently the Nintendo Switch eShop, Slime-san is a terrific take on games like Super Meat Boy and N++ that does enough to separate itself from the competition and in general just be uproariously good time. Slime-san's 100 levels are split up between five worlds of 20 levels each. Most levels feature four rooms to them, and completing each room serves as a checkpoint, which is a godsend--or in this case, slime-send-- as it's one hit and your slime is no more. And you will be dying a lot. Thankfully, being brought back to try the current room again is a swift process. Rooms have a set way to move through them, but speedrunners and genre experts can use high risk, high reward shortcuts to slice off sizable chunks of time. It feels so very good to go off the beaten path from the way Slime-san intends for starting players to go through levels and get rewarded for it. 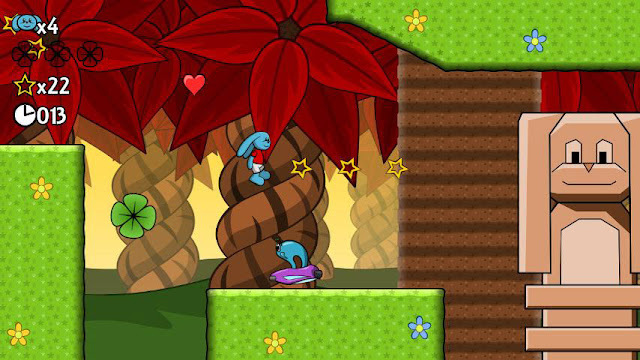 It's not a hop, skip, and a jump to finish levels in Slime-san. It's more of needing a wing and a prayer. A strict color palette of only five colors is not only an artistic choice in Slime-san, but it is also prominent for gameplay reasons as well. White walls and ceilings are safe to the touch while anything red is generally instant death upon touching it. Meanwhile, our slime hero has the ability to switch between a solid form and a transparent form with the press of the left shoulder button. 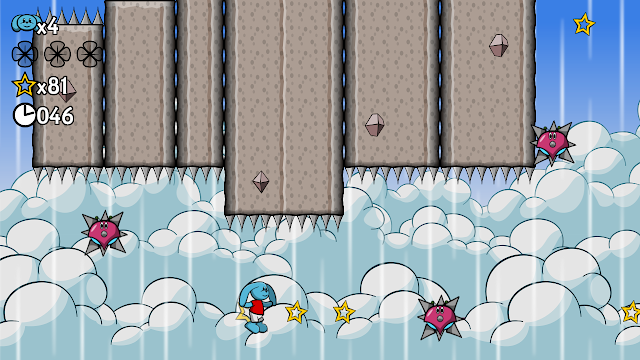 This allows him to pass through green blocks and walls when transparent. Quite quickly in Slime-san, levels require shifting between solid and transparent forms in succession with great precision to survive. A general lesson of Slime-san: Red is bad; Green is good. There are also color blind options, if you have problems distinguishing between colors. 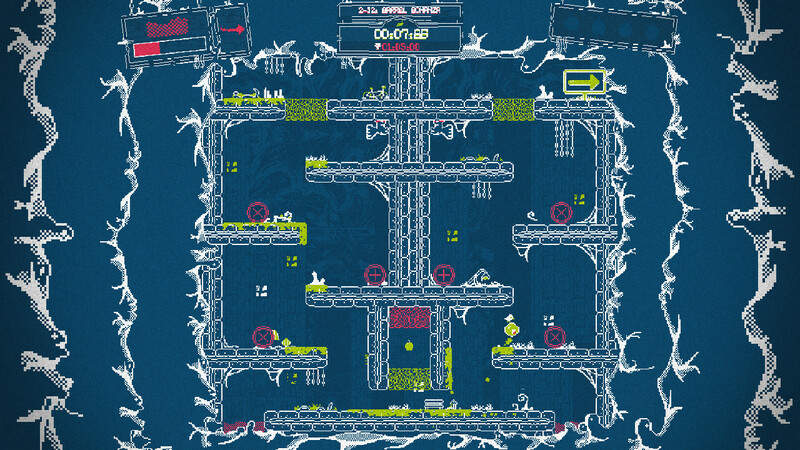 Levels in Slime-san constantly introduce new mechanics, obstacles, and challenges into the fray to keep things fresh, even towards the final levels of the game. 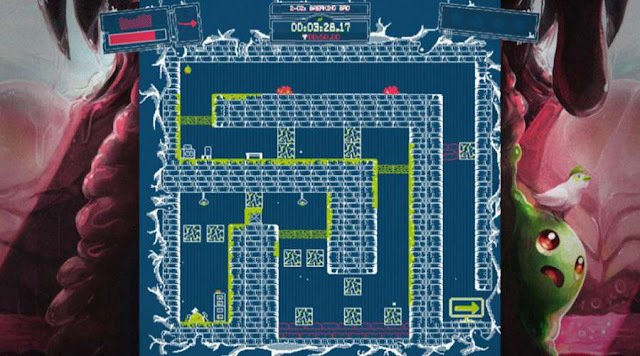 From blocks and walls that disappear when in transparent mode and reappear when the slime is solid to gravity segments that flip the slime from running on the floor to skimming along the ceiling, to color-coded key-like doors that unlock gates to vines that allow Slime-san to swing across chasms and up to higher areas, this game is not shy about bringing a lot of variety when it comes to new mechanics to be taught to the player and for the player to overcome them. Slime-san controls well. One button is there to jump, one to become solid and transparent, and one to dash, either on ground or in midair. Sadly, this is where Slime-san can become a little confusing to play. The neat thing about Super Meat Boy is that the controls are simple; one has but a small amount of things to worry about while playing: running and jumping (the latter in both normal jump and wall jump forms). Slime-san makes it so you have to concern yourself with multiple moves at once. Many times it felt like I was attempting to pat my head while rubbing my tummy. Okay, well, doing those two things isn't exactly tough, but you get my point with the reference there. It can become difficult to do a series of required movements with all of the options available to you, merely complicating the platforming and causing more deaths than I would have liked because of it. Mind you, you'll die a lot even when you have become accustomed to all the maneuvers in Slime-san's repertoire, but being flabbergasted by the controls at moments is annoying all the same. 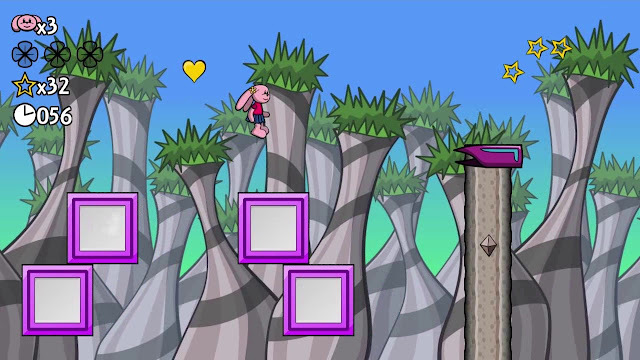 This early level features boxes to dash into to create platforms to safely cross this hazardous pink goo. 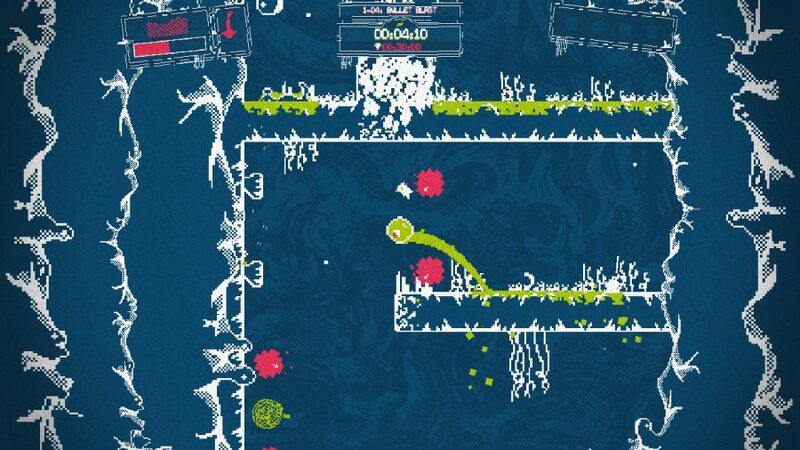 If you wish to run through each level of Slime-san to reach the end of the game, your playtime might last about eight hours or so. For those that desire the most bang for their buck, there are a lot of side content to sink your teeth into. For one, each level, outside of boss battles that conclude each of the five sets of 20 levels, has four apples to collect, one in each room of a level. Not only do these serve as nice collectibles, but they're placed in some pretty crafty locations. I don't mean cleverly hidden or anything like that. Instead, they are situated in precarious spots. Sometimes you'll need to do some dangerous, risky jumping to reach them, others will require you to take the long way or more so, a detour to nab them. While this might not seem so bad, each room in the game has a timer of sorts that when it reaches zero, pink acid starts to move through the room from a predetermined side. Touching it like any hazard in Slime-san results in a swift and slimy death. Also, some levels in particular feature hidden areas that lead to NPCs within, and Slime-san can invite them to the town within the worm. Yep, there is a town within Slime-san (talking about the game here) that serves as a special site where Slime-san (talking about the character now) can visit to accomplish a number of tasks and see all the sights that the city has to offer. He can use his bravely collected apples to trade with NPCs to do things like buy new costumes and accessories, new slime types that deliver positive and negative powers depending on the one purchased and equipped (such as higher jumping prowess but slower speed, for instance), and much more. The town in question, Slumptown is a happening place where you speak to the townspeople, including the NPCs you rescued from the bowels of the worm beast. This leads me to talk about what further content is available in Slime-san. There are your standard time trials to earn trophies for beating the record time in each level, of course, but there is also post-game content as well! After beating the initial 100 levels, you can play a New Game+ mode that alters the enemy and obstacle placement of the original levels. Additionally, a Boss Rush option opens, and these boss fights are quite clever, because Slime-san can't actually attack any enemy, he has to use obstacles and other means to bring these baddie bosses down. 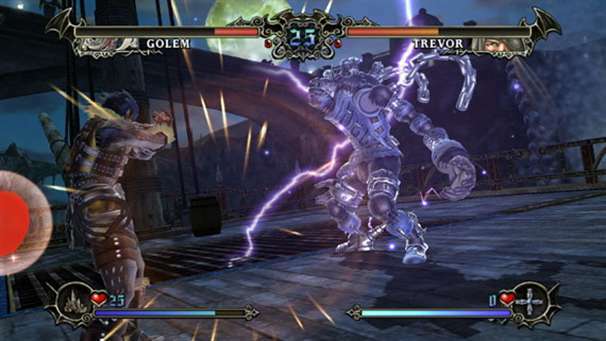 They're action-packed fights that lean heavily on puzzle-like approaches. Boss battles require quick thinking, quick platforming, and quick reloading for when you die many times trying to figure out what to do to beat these big, bad bosses! To me, Slime-san has a polarizing graphic style to it. Obviously it's retro-focused, but looking at the game in screenshot form, the look is a bit too rough on my eyes and almost gives me a headache on the closer-in shots. The more zoomed out ones are much more pleasant to look at. Regardless, Slime-san looks much better in motion, but you really need to appreciate old school styles to get the most out of it. For a further, more authentic retro experience, Slime-san brings with it several visual filters that you can add to the game by purchasing them in Slumptown, whether VHS-styled, CRT-styled, and even a shout-out to the doomed Virtual Boy, an all red aesthetic headache in the making. While Slime-san generally performs well with regards to its frame-rate, on more than one occasion have I died to the FPS plummeting into the single digits. With a patch on the way according to the developers, though, this shouldn't be an issue on the Nintendo Switch version very soon. You can purchase borders to line the sides of the play field as well from a shop in Slumptown. Slime-san is a much welcomed addition to the Nintendo Switch's arsenal of indie games. Bursting to the seams with content, packing in 100 levels in both classic and remixed modes, levels themselves consistently providing new hooks and additions to the gameplay, creative boss battles, a hefty challenge, and 5-bit visual delight, Slime-san presented me with a slimy and sticky situation that I didn't mind being stuck in at all. Review code provided by Headup Games. So many games, so little time. Isn't that always the way it is? Well, it definitely is when you review games like I do! Especially when you have deadlines! But enough about my struggles here, we're talking about a recent iOS and Android 2D platformer, Pauli's Adventure Island. Let's check it out and hopefully jump for joy! With a ridiculous amount of mobile games launching on the App Store and the Google Play storefront each and every week, games get lost in the shuffle, and many are easy to ignore. There is just no time to play all of them, only to find out that you've wasted your time downloading it. I do have a soft spot, however, for a competent 2D platformer. The best in the genre are some of my favorite games of all time, and I just love the platformer, 2D or 3D, regardless. Upon reading about Pauli's Adventure Island, I wasn't too impressed by what I saw. However, when watching the gameplay trailer, the game seemed like a well made game worth looking into. It actually was, though several aspects stop Pauli's Adventure Island from being special. Good luck will come to those players who gather all of the clovers in the game. 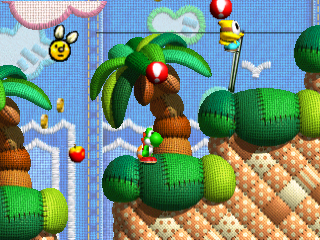 One of the main reasons for this is that Pauli's Adventure Island certainly takes a lot of inspiration from the Super Mario Bros. series, most notably the recent New Super Mario Bros. titles. Everything from collecting three Star Coin-like clovers in each level to obstacles and ideas taken directly from the games. I'm talking platforms that you bounce off of while avoiding enemies who do the same (similar to mushroom platforms in New Super Mario Bros. 2) , square and rectangular platforms that rotate around one another with some posing the risk of crushing your cute, wittle wabbit, platforms that follow along a set track complete with Fuzzy-like enemies to avoid, familiar underground and castle-themed stages that occur around the same time in a world as they would in a Super Mario Bros. game, and more. That said, if you're going to take inspiration from a platforming series, why not take from the best? During many levels, I would ask myself, "Haven't I seen this somewhere before?" What the developer behind Pauli's Adventure Island was also influenced by the Super Mario Bros. series, and this is a very good thing, is the tight and satisfying controls. In Mario games, Mario, Luigi, and whoever else joins his running and jumping cause, control well with no delay between the player's button inputs and the action the character does. This is most impressive in Pauli's Adventure Island because not only did the developer nail the feel of control of the stars of the game, but they managed to do it on a mobile device using a touch screen as the only source of input. During many games, I'd worry about my thumbs covering up the screen over something important, or worse off, covering my view of what I was doing. This is not the case with Pauli's Adventure Island. The directional buttons one can press on the lower left hand corner of the screen and the A and B inputs on the lower right hand corner are easy to reach and do not get your thumbs in the way. The simple to learn inputs like running, jumping, rolling, and hovering in the air in certain wind tunnel sections in the game all control and play out smoothly. Incredibly commendable. The level design won't blow anyone's mind or anything, but it's competent to say the least. 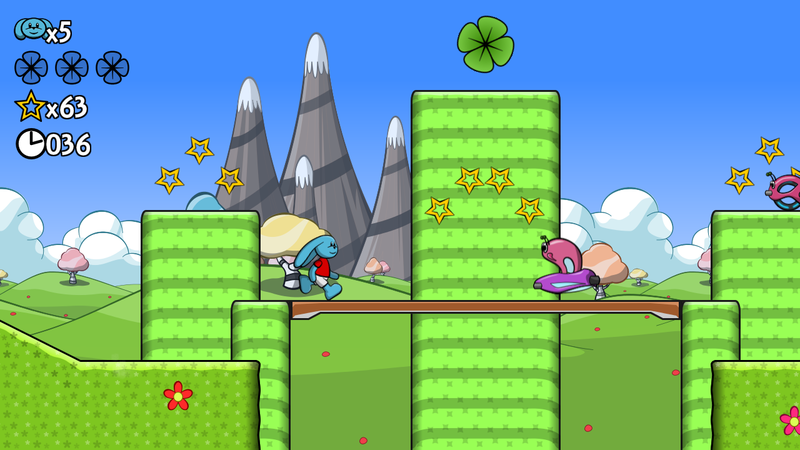 Some of the clovers hidden in levels are smartly placed, and a bit of the platforming can be a bit tricky. There are four worlds of eight levels each, with the final level in each world consisting of a basic boss battle. For each level you can do the optional task of collecting all three clovers as well as beating the level under a specific target time. Most levels you can do this all in one run, but some later ones are challenging to do so. Regardless, you need not complete both tasks in one run anyway. Time to take you out, Not-Koopa-Troopa enemy! The 32 levels on offer, however, don't last long. In fact, the entirety of Pauli's Adventure Island is easily completed in under two hours at max. This stings less because the game is free, only offering a one-time purchase if you absolutely cannot stand occasional ads after every two levels, but something more substantial for replay value would be preferred. I'm talking about things like a harder mode with different and more challenging enemy placements, a requirement to beat the game as both of the two rabbit characters to earn an achievement, and things like that. As it stands, your mileage with Pauli will hardly last the duration of John Claude Van Daam's Sudden Death. Yes, it's a strange movie to choose, but it's a guilty pleasure! but otherwise nothing too notable about the presentation. Presentation-wise, Pauli's Adventure Island has a freemium appearance to it, perhaps even an internet browser game. The character animations are basic and while the backgrounds have a good amount of charm to them, they are also a bit modest in impact. The music features some hum-able tunes, but nothing that I can personally remember after playing the game. Nonetheless, while the presentation of Pauli's Adventure Island doesn't really have much "wow" factor, it's all pleasant overall. Pauli's Adventure Island is a serviceable platformer which I wish would have received more time in the proverbial oven, perhaps to add more worlds and interesting obstacles. Everything presently is very safe and doesn't stray too far from 2D platformers like Super Mario Bros. The foundations for a great game are here, and if a sequel were to materialize from the developer, my interest would certainly be there to try it out. I just found myself enjoying my two hour play session with Pauli, and just saying, "that's it?" when my adventure was speedily over without much fanfare or buildup. Still, a fun game is a fun game, and Pauli's Adventure Island was just that. It's worth a play for 2D platformer maniacs like myself, but don't expect anything too amazing from it. No, SuperPhillip Central's Favorite VGMs isn't sharing depressing music or anything somber this week! Far from it! Instead, it's delivering music from games that have dark undertones and/or settings, games with a bit of an edge to them, and songs that are featured in final boss fights against sinister villains. Beginning with Castlevania: Order of Ecclesia, we will listen to a fantastic arranged theme from this third Castlevania on the Nintendo DS. Then, we move on and take flight with the arcade shmup Ikaruga before feeling the edge of Jak 3. 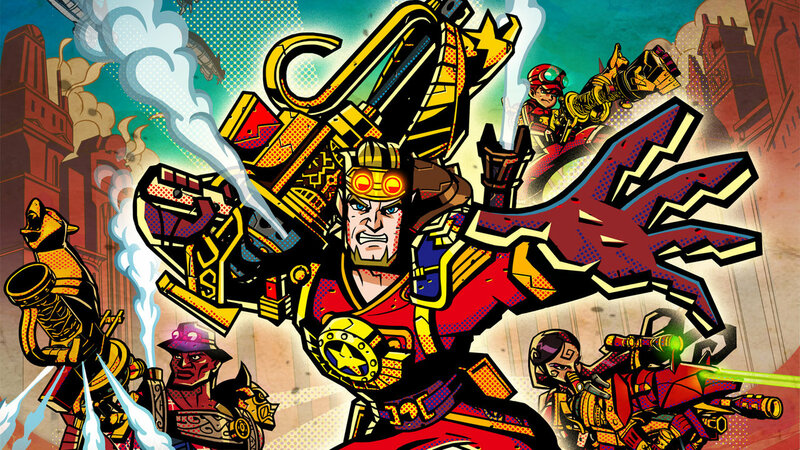 Intelligent Systems' attempt at creating a successful new franchise for Nintendo may have backfired commercially, but Code Name: S.T.E.A.M. offers great music and gameplay to boot. Ending this edition of SuperPhillip Central's Favorite VGMs is a final boss theme from Final Fantasy XIII. Just click on the VGM volume name to go to the YouTube page where you can hear that song. Per usual, check out SuperPhillip Central's VGM Database for every song mentioned on this weekly segment. Now, let's get on to the music! I have editions of SuperPhillip Central's Favorite VGMs planned out in weekly chunks, already having what games and songs I want to feature each week. A song from Anarchy Reigns was set for this edition to kick things off, but because of the horrific and terrifying events over the weekend in Charlottesville, the game, song, and lyrics in question were too inappropriate, tacky, and tasteless to use in this week's edition. Instead, we have a wonderful replacement with Castlevania: Order of Ecclesia! It's an arranged track from the game in the form of Dusk Holy Mark. The original song used in the Nintendo DS release was great enough already, but this arranged version is simply delightful as well. I find Order of Ecclesia to be one of the most difficult of the Metroid-styled Castlevanias out there. Would you agree? Take flight in this color-coded shmup that was originally released on the Sega Dreamcast and then later the Nintendo GameCube. Ikaruga's main gameplay feature is being to change colors to avoid enemy bullets. It's quite the bullet hell shooter, but this ability to change between two colors on the fly brings something new to the table. Plus, the game is addictive as all get out. 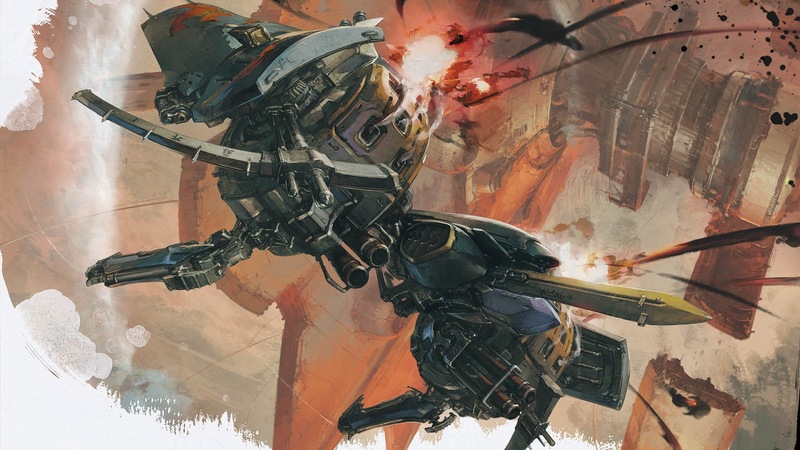 This theme that represents Ikaruga on SuperPhillip Central's Favorite VGMs launches players into the fast and fluid action with some spirited music to accompany them. It's no secret that I thought that Naughty Dog changing Jak from the first Jak and Daxter into an edgier version with guns was laughable at best and worthy of cringing at worst, but the games that succeeded The Precursor Legacy ended up being okay affairs all to their own. 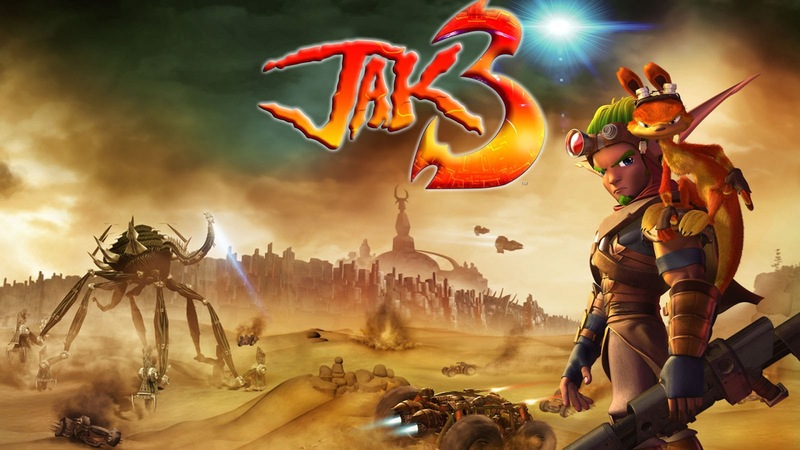 Influenced by open world games at the time like Grand Theft Auto--and what better way to connect with the kids than turning a colorful platformer into a gritty and edgy third-person shooter/platformer hybrid--Jak II and more impressively Jak 3 offered engaging gameplay and solid enough music to be enjoyable experiences. Intelligent Systems churned out challenging, innovative, and interesting new IP with Code Name: S.T.E.A.M., a strategy RPG that was quite atypical compared to its competition. 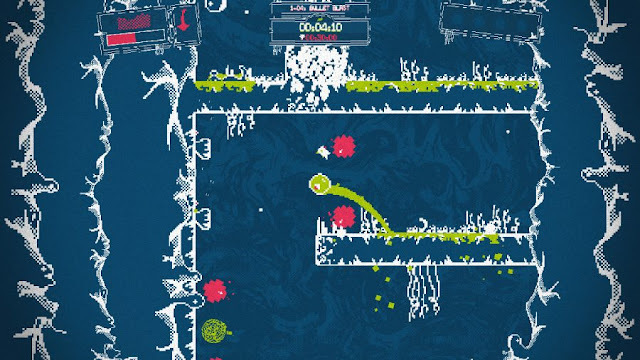 The slowness of enemy turns created a lot of disinterest for the game, and while it was very quickly fixed with a patch soon after launch, the damage had already been done. Now, one can readily find a copy of Code Name: S.T.E.A.M. lingering in bargain bins for low prices. It's a shame, as not only is the gameplay really rewarding, but the style of the game in both creativity with the story and characters, the settings, the art, and of course, the music were all terrific. Well, I'm obviously speaking subjectively here. Last Thursday, SuperPhillip Central showed off a special edition of Best Boss Battles in Gaming History which showcased some recent awesome final boss battles. To round out this edition of SuperPhillip Central's Favorite VGMs, let's hear the theme for the final boss of Final Fantasy XIII. Despite a lot of things within the game that went wrong, leading to its negative critic and fan feedback, one part of Final Fantasy XIII that truly shined was Masashi Hamauzu's incredible score for the game. Seriously, take an afternoon to listen to the full soundtrack. You won't be disappointed. After much hype for the return of classic Sonic the Hedgehog gaming from a team that finally knows their stuff, Sonic Mania launches digitally tomorrow for Nintendo Switch, PlayStation 4, Xbox One, and PC. Check out this incredible trailer combining animated scenes with featured sections of gameplay.